Hot out of the oven, imagine the herbaceous perfume of Olio Nuovo, the freshest first crushed olive oil of the season! This loaf incorporates fresh extra virgin olive oil (EVOO) as well as a drizzle both when going in the oven and after coming out. The recipe below will work in a bread machine, stand mixer, or with good ol’ fashioned hand kneading. This bread is a fantastic accompanying a hearty stew, or any dish that generates sauce or gravy for dipping. If using a bread machine, add 3 tablespoons of olive oil and the remainder of the liquids, honey/sugar, salt, to the pan. Then add both flours, followed by the yeast last. Follow the manufacturer’s instructions for your bread machine if you intend to bake it in the machine. If using a stand mixer or mixing/kneading by hand, mix and then knead the dough for about 6 minutes. The dough should be very soft, but not sticky. Add more flour, in small amounts, as needed to keep the dough from sticking. Allow to rise in a warm spot for about an hour. Lightly punch the dough down, transfer to a baking sheet lined with parchment and gently reshape in to a rustic loaf. Cover the dough with plastic wrap lightly greased with olive oil. Allow the dough to rise for 45 additional minutes. Preheat the oven to 375 degrees and adjust the rack to the center of the oven. Drizzle the loaf with two tablespoons of olio nuovo EVOO, and bake for about 40 minutes, until golden brown, or a digital thermometer inserted in to the center of the loaf registers 199 degrees. 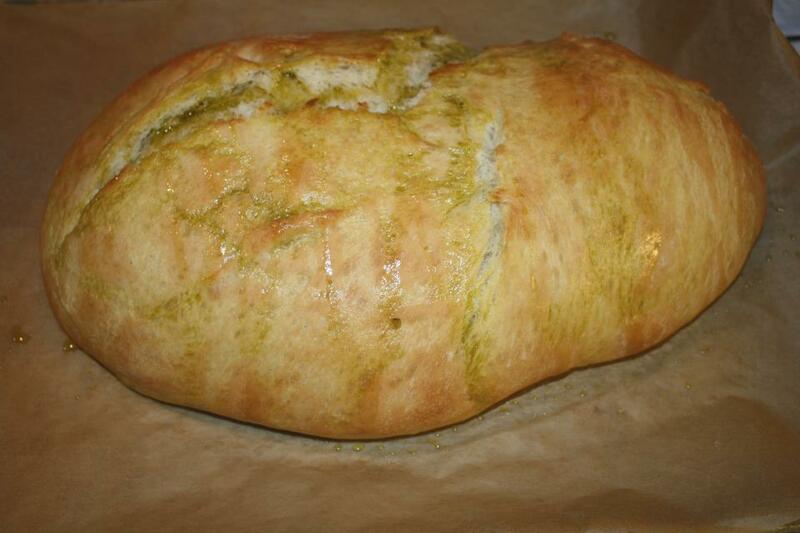 Remove the loaf and immediately drizzle with remaining tablespoon of olio nuovo EVOO. Allow to cool for at least 10 minutes before serving. Best served warm!